You are about to report this pin location as incorrect. Where should this pin be located? Click here to submit your review. Click here to Show reviews. Please write a meaningful review (i.e. don't just say "excellent" or "hated it")! Say what you liked about the food, customer service or even provide tips for future patrons & suggest areas needing improvement. Please do not post location requests here - email, tweet or facebook message the operator directly with those requests. I had the opportunity to try a spoon full of one of my co-workers order called the N-Da'-Mode (Special). I all I can say is WOW.. The pound cake was nice and warm with the ice cream and caramel drizzles.. Yummy, Yummy, Yummy.. I look forward to seeing you back at NOMA!! I ordered the coconut, but I was so confused when it came back with chocolate bits in it. I'm not a big chocolate fan, so I asked if they gave me the right order. The woman said yes, it was toasted coconut. I ate the ice cream, but the chocolate overpowered the coconut if this was the right order. I was expecting a 100% coconut ice cream. I was disappointed by the flavor, even though the ice cream was good. This was 2 of the friendliest and patients ladies. The 2 scoops with topping was more than adequate in size, was not about to melt, today was pretty humid and they offer a nice variety. But, the best part was they smiled while serve you and with enthusiam. It will be a long hot summer, they will see me a lot. You should give them a shot. Thanks Ladies!! Friendly service and the best coconut ice cream I have EVER had. Bits of coconut in smooth creamy ice dream. Awesome!Customer Service was great!Served with a smile! OMG!! I love this truck. I get EXCITED whenever I see it!!!!! The ladies who serve are VERY nice, patient and help you with your order! The truck is appealing and, it's just great! Best believe, I'll be out there TODAY, 10/25/2013 @ Patriot's Plaza!!!!! YUM! The ladies that run this truck are always friendly. Order is fast & correct. Their MilkQuakes (shakes) are, according to my son, some of the best to be had. The coconut ice cream is fabulous. It tastes like the inside of a coconut but frozen and creamy. Not overly sweet, just fresh and smooooth. I have never had a disappointing flavor from SC, but this was really special. When I saw street cream emblazoned across a food truck outside of the office that I solicit business from, I came running with open arms. Although it wasn't the streat cream I was expecting, It was fulfilling and pleasurable nonetheless. Thanks for helping me get my fix, and for not giving me two black eyes. Street Cream® LLC is an innovative dessert food truck that serves premium hand scooped ice cream paired with a variety of homemade desserts. 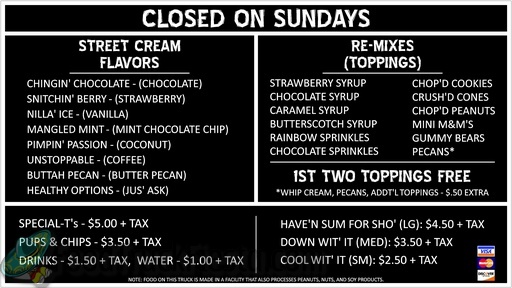 Launched in Washington, DC on June 2, 2012, they deliver frozen confections with an energetic hip-hop flair while making customer service their top priority. 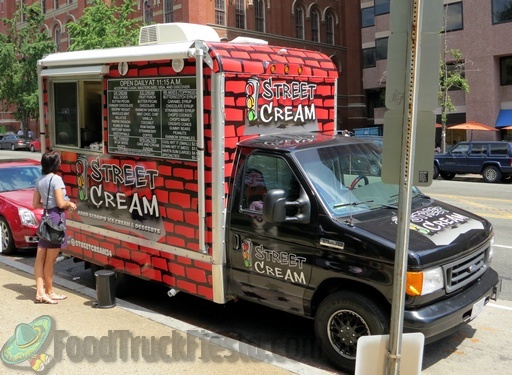 Be on the lookout … Street Cream is coming to a block near you! You may contact them via Email, Facebook or Twitter. Get the truth about starting up and running your own food truck business from this comprehensive eBook! Gray truck names mean that they haven't tweeted for 7 days or longer. They regain color once they tweet again. Looking for a used truck? S&L Customs has several used trucks on site, ready to be fitted with your kitchen! Contact them now.